Reincarnation is a spiritual belief that our souls are reborn many times to this physical Earth plane. These many lives give us the opportunity to experience a variety of circumstances and create karma, the law of cause and effect. Through these experiences one grows, until ultimately one’s soul reaches a level in which it transcends to another dimension. Once in these other dimensions our souls continue their evolution toward oneness with Source. I have always believed in reincarnation myself and have explored the idea in various paintings. 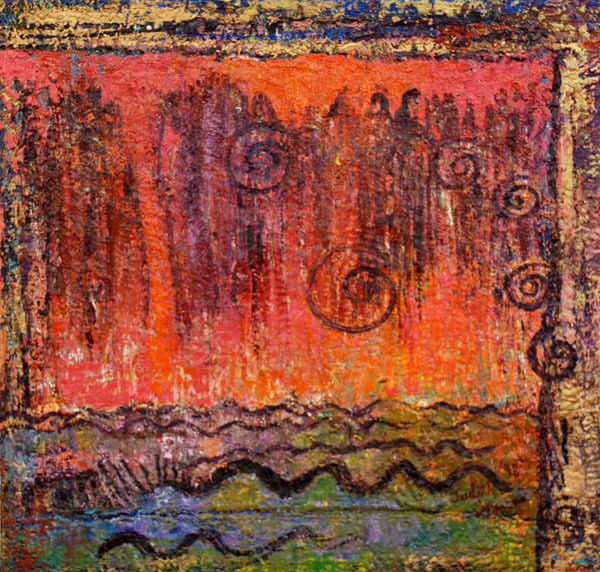 This painting, Many Lives, illustrates that belief. The far left figure is my present self and the other figures represent selves I might have been in past lives. But the concept of reincarnation is not as ancient as I thought it was. It is difficult to known exact beliefs of peoples who lived before written history began but some scholars feel that ancient cultures who practiced shamanistic Earth-based religions had a concept of reincarnation. But other scholars believe that these tribes taught only of the preexistence of the soul before birth or its independent survival after death in an Otherworld. The Egyptian Book of the Dead tells how the soul travels to the next world but makes no allusions to its return to earth. Most Egyptologists agree that the ancient Egyptian concept of transmigration of the soul do not represent the reincarnation of our current day understanding. The practice of mummification and filling of the burial chambers with objects of beauty and necessity was meant to aide the deceased in the next world not in rebirth to another physical body. The classic form of reincarnation originated in India. One finds mention of some type of transmigration of the soul in the ancient sections of the Veda, composed between 1500 and 1000 BCE. Its first complete mention is found in the Brihadaranyada Upanishad. The fully developed idea of reincarnation and karma came in the Puranic age and was then spread though out the East through Buddhism, reaching its full flowering around 300 BCE. The ancient Greeks developed their own concepts of reincarnation. Pythagoras (569 – 500 BCE) taught that the soul was immortal and experiences a series of rebirths. Between lives the soul rests and is purified in the Underworld. Plato (428 – 348 BCE) shared similar views as Pythagoras with one big difference. He claimed that our souls become impure during their bodily experiences. Unless these souls used their lives to improve they would end up in a place of eternal damnation. By the 3rd century AD, Neo-Platonism had adopted a belief in reincarnation similar to that of Hinduism. Greek and Roman writers of the first century AD noted with surprise that the Druids, the priestly caste of the Celts, believed in reincarnation. Even Julius Caesar wrote about the Celts belief in reincarnation and attributed their valor in battle to this belief in rebirth. Within the Celtic stories and myths one sees many instances of a belief in transmigration of souls and reincarnation. The Celtic belief in a world of spirit includes the belief that spirit inhabits the bodies of people, animals, plants, trees and can even manifest in places such as wells, caves, rivers, and fields. They believed that a person’s spirit could migrate between these worlds. The concept of reincarnation is seen in the many instances of shape-shifting, otherworldly experiences, rebirth for exceptional people and the passing of a spirit through a family’s bloodline. The story of Arianrhod, Celtic Sky Goddess, illustrates a very early belief in reincarnation. Her castle, Caer Sidi was also known as Annwn, the Otherworld, land of the dead. People were brought there when they died. As “Silver Wheel”, Arianrhod was also responsible for the souls of warriors who fell in battle. She gathered them aboard her ship, the Oar Wheel. and transported them to Emania, also know as Moonland. In the Northern sky, whirling around the enduring stability of the north star, Arianrhod presided over the fates of departed souls, nurturing their journeys between lives. And certainly the story of Etain, illustrates the belief in reincarnation. Beautiful Etain, who was changed into a butterfly by Midir’s jealous wife, was buffeted about over rocks and sea for many years before finally she was reborn 1000 years later as a beautiful baby girl, also named Etain, to an Ulster chieftain and his wife. Our modern concept of reincarnation seems to be heavily influenced by the 19th century spiritual movement of Theosophy. In 1875, Helena Blavatsky founded the Theosophy Society. This organization drew from earlier theosophical ideas and included concepts of esoteric eastern religions. In addition the Theosophists together with the later work of Edgar Cayce explored the idea of soul families who reincarnate together over many lifetimes, playing various roles for one another. 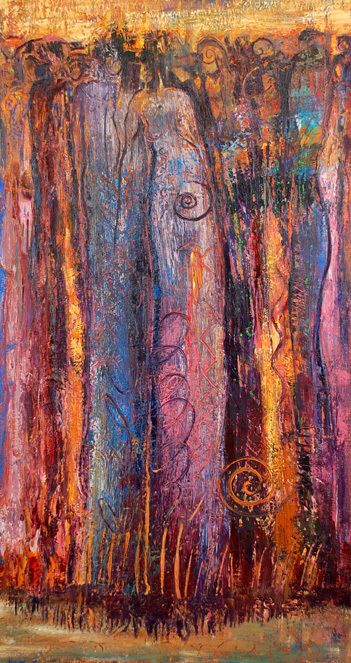 I have also been drawn to the idea of soul families, exploring it in a series of paintings. Soul Family, and Ancestral Gathering I illustrate my ongoing belief in the combined concept of reincarnation and soul families. It is intriguing how spiritual concepts grow and change over time. Of course spiritual belief is a matter of faith. There is no scientific proof that reincarnation or soul families exist. But this belief gives me comfort in a world full of both pain and suffering and beauty and ecstasy. For some reason beyond reason it makes sense to me and explains many of the strange twists of fate endured by us all. website. 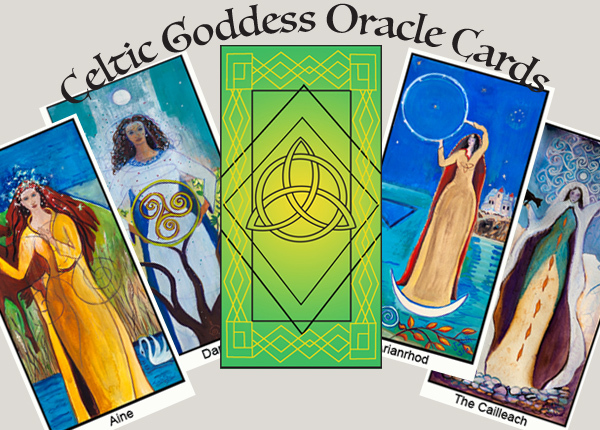 Experience the wisdom of the Celtic Goddesses! Love your paintings, Judith. Rich,resonant with depths to be plumbed. Like our lives. Thanks Elizabeth. I so love the respect that FAR readers and bloggers have for creativity and spiritual inquiry. Thanks for your thoughts freecatholic808. So very true that our lives have many layers and depths to explore. p.s. I don’t mean to hide my identity, Judith :-) This is Dawn Morais Webster. I use my wordpress account–which is the name of my blog and twitter accounts…..
Hi Dawn, Nice to meet you through FAR. I checked out your blog – excellent work. Thanks for sharing. Thanks Judith, a fascinating post, wonderfully warm, gorgeous paintings too, and an extended family of related ideas. Thanks Sarah – BTW I love your website. I usually think of death more around the end of October – All Hallows Eve, All Saints Day, etc. By writing of it during this Spring time of new growth, you’ve reminded me again of the whole picture/cycle of life and death integrated and dancing together. Thanks Judith, for giving me a break from the surround of moving boxes and re-settling – or at least providing a new perspective! Barbara, interestingly I hesitated to write about reincarnation at this time of year. I usually think more about death around Samhain and Winter Solstice also. But I was feeling it so I figured oh well these things are always with us. Glad the post gave you a moment’s respite from moving. Brava. Gorgeous paintings, as usual. Back in the 80s, when I was first opening to things psychic (not having had any interest in anything not literary while I was in graduate school), I had a spontaneous vision of an earlier life. It was very interesting. I wrote my Ph.D.dissertation about Cleopatra. In the early 90s, a trance medium told me I had been Cleopatra, one boyfriend had been Caesar, another had been Antony. Yeah. Sure.We can believe in things, but let’s not be credulous. We were not all kings and queens in earlier lives. I also believe that we do not say, “I’ll give myself AIDS or cancer as a challenge in my next life.” We live our lives as they come along. Barbara, was your spontaneous vision of an earlier life that you had been Cleopatra or was that what the medium told you? Even if it was your vision I also would question it. With all the millions and millions (or is it billions) of lives that have existed on this Earth only a few have been famous. So if reincarnation does exist the vast majority of us lived ordinary lives – too many people to have all been famous figures. Have you ever read “Many Masters, Many Lives” by Brian Weiss? It an interesting account by a psychotherapist who unexpectedly encountered his patients’ past lives through his therapeutic work with them. It’s a scientific look at the spiritual. I find it interesting that many scientific theories and thoughts today are corresponding with spiritual beliefs. It’s hard to imagine that a soul would chose to experience a life of suffering but the existence of life is such a deep, deep mystery that the details of the where and how of it all is way beyond my ability to understand. I guess it’s our challenge to live the life we have (be it the only one, a difficult one, a great one… whatever) the best we can. I really don’t believe this— just more of the toxic old age men—- if men had had previous lifetimes as women, well you’d never guess. The total population of the earth far exceeds the population when the idea of reincarnation began. What I think it actually is is pre-science understanding of DNA, and how people born into families resemble parents are grandparents genetically. Otherwise it’s just more MBS— male b– s—. Why do women get suckered with this male old age stuff? Really. Turtle Woman – Luckily we live in a time and place where we have religious freedom and we are each free to believe as we choose. Personally I don’t see any elements of patriarchal oppression in the concept of reincarnation. It’s a belief that we experience many different lives – as women, men, rich, poor, healthy, ill, African, Asian, Caucasian, Native America, etc. etc. Women around the world have many different beliefs – some I agree with, some I don’t. But respect of each other is important. For me it depends on a person’s understanding of reincarnation whether there are patriarchal overtones of not. In most people’s conception — coming from mainstream Hindu and Buddhist ideas — reincarnation is a curse of sorts, something that one wants to escape and with, to escape the body and its suffering by finding/entering “moksha” or “nirvana.” I believe that I have reincarnated many times, but I believe I keep coming back, because I love the body and I love life. I don’t want to escape them. I also believe that discovering our past lives is only useful if it helps us to live THIS life. Otherwise it can be a distraction. Nancy Vedder-Shults, my personal concept of reincarnation is in line with yours. I worship Goddess because she embodies the essence of love and beauty manifest in physical form. This or these lives that we have are gifts to be lived with joy. Also i think you are correct in that past lives can be a distraction. After all we really don’t remember them easily do we. But used therapeutically there discovery can be useful in dealing with current life’s issues. I guess I see the traditional view of reincarnation as more of a value judgement place on physical life which is negative in that view. I am grateful that consciousness is changing and we are opening ourselves again to loving physical life as a beautiful manifestation of spirit. the hatred of women who give life leading to the desire to transcend the physical. Any ideas?…. Judith, this resonates so strongly with so many of us that I am inclined to think that it is more than wishful thinking. I tend to envision our souls as clouds of dust that settle upon birds or stones or seeds to bring our spirit into other lives, joining with other bits of dust to continually form fascinating new entities. Those little sparks that we sometimes feel may indeed be real parts of us. As you note, there is no way of proving it one way or another, but it is fascinating. MaryAnn, what a beautiful vision you have of our souls of clouds of dust settling here there and yonder. Thanks for sharing it here. I had a soul realignment and someone explained two of my past 14 lives. It was interesting b/c it actually validated a lot of what I feel and explained my personality. This person did not know much about me and in one past life I had a bad marriage and as were were talking I remembered the these images in my head I had of me being in a bad marriage.They were there for years. My fear of reincarnation is being (re)born into an abusive home. But I have read that other souls around us seem to stick together even if in different relationships. I used to be very much against reincarnation but now I have to rethink that after my experience. kris799, that’s a very interesting experience you had. When we experience something on the feeling level it definitely touches a deep chord. A number of years ago I used a visualization technique to delve into my past lives. I experienced two very different ones. During the experiences I felt the emotions of those lives very deeply. Still, many years later I remember them vividly. A soul is re-born in a human body. Who chooses the recipient and for what purpose? If we knew what we had done wrong in a previous birth, we can try and undo the deficit in our characters. A person has to accept his lot. If we commit a crime and are caught, the magistrate tells us this is what you did and you are punished for this by going to prison or whatever. In reincarnation and transmigration, intelligent human beings have to accept their lot for some imaginary deficiency in a past birth. It is too ridiculous and intelligence will refuse to accept this. Again, of what benefit is our re-incarnation, we can make the same mistake again and again. In nature, there is always onward progress Minerals pass into the plant kingdom, the plant into the animal kingdom and on into the human kingdom. There is no retrogression. Because we cannot see or visualise life after death also does not mean there is no life. A foetus does not visualise post-natal life. John, most definitely our challenge is to live our lives the best that we can. Ultimately all we ever have is the “now” even in this life. Yesterday is gone and tomorrow might never come. Our current understanding of reincarnation is not one of punishment but one of experiencing all that life has to offer and learning and growing. Note Nancy Veder-Shults comment above about classical Indian concepts. Some scholars believe that Jesus’s words “In my Father’s kingdom, there are many mansions” refer to reincarnation. Obviously you don’t interpret it that way. Ultimately on spiritual topics one’s belief is simply that – a matter of faith. None of the religious or spiritual concepts can actually be proved. Thank you for this excellent post, your inspiring paintings and the interesting comments they have generated. I especially liked learning more about Arianrhod, and found myself wondering if she is the Celtic form of Ariadne? In astronomy, Ariadne is linked to the northern constellation, Corona Borealis (aka Ariadne’s Crown), so I’m also wondering if Arianrhod’s Moonland is referring to the same constellation? Nick, in my research on Arianrhod (see my post on Her in FAR here – https://feminismandreligion.com/2013/02/23/arianrhod-celtic-star-goddess-2/ ) I did discover mention of her being a Celtic form of Ariadne which probably relates to both of them being associated with the Corona Borealis. They were both also badly betrayed by men. The Celtic Goddesses who I have been exploring are fascinating, deep and very complicated with many contradictory stories and interpretations. This all provides much food for thought. Thanks for the link to your previous post on Arianrhod. It was before I signed up with FAR so I hadn’t seen it before. I like the title for Her of “Silver Wheel” as it nicely describes the movement of the circumpolar stars in the northern hemisphere as compared to the zodiacal stars that circle the equatorial regions of Earth. When I gaze at the constellation, Corona Borealis (which you did reference in your earlier blog :-)) it is usually directly overhead and does look like a “crown”. As the night proceeds it eventually disappears into the Gulf of Mexico from my perch on the Gulf side of Florida much like the ancient Celts must have seen it dip into the Atlantic ocean. Hi Nick, It’s always great to connect with others who love the night sky. Sounds like you have a lovely spot for star gazing. I’ll never forget when I lived in Greece how the waning moon would turn blood red as it dipped into the Aegean Sea in the wee hours of the night. In answer to your question, I believe from my reading of history that patriarchy came first, i.e. that oppression of women, of “others” (as slaves), and warfare (all aspects of patriarchy) began as part of a hierarchical society and that this social configuration needed an ethos or belief system that denigrated women in order to work. The best way to do that is to denigrate the bodies that give birth, so a transcendental religion (transcending physical life) fits the bill. One book that led me to this conclusion was Gerda Lerner’s _The Creation of Patriarchy_. Thanks for your thoughts. That makes sense. I’ll have to check out Lerner’s book. There is a Kabbalistic tradition in Judaism that posits reincarnation as well. It is part of our mystical tradition from the 1200s. The Zohar says that one’s mission in life may be spread over many lifetimes (Zohar I 186b). I didn’t see this included in your summary so I thought I would share. Ivy Helman, Thanks for that additional piece of info about reincarnation in Judaism. I didn’t uncover that in my research. It is interesting how worldwide the belief has been, though sometimes hidden from us now. I know about my previous birth. My name was Kamta Prasad Sinha and I later became Fourth Spiritual Guru of Radhasoami Faith. Kamta Prasad Sinha then knows as Sarkar Sahab. This was revealed to me by His Holiness Maharaj Sahab (1881-1907), the Third Spiritual Head of Radhasoami Faith. Sarkar Sahab (1871-1913) left the world at a very early age. He could not complete all his work during this period. Now I am completing those work from where I left the work in my previous birth.